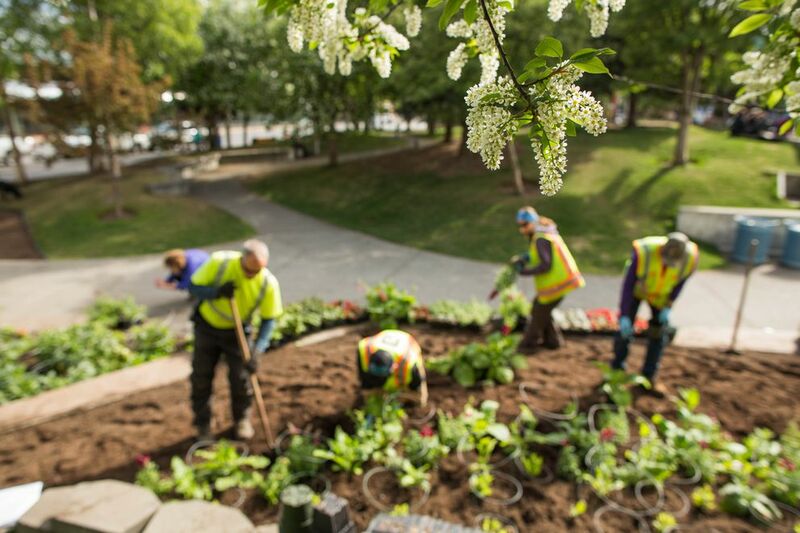 Weary of perennial budget battles over downtown Anchorage’s flowerbeds and hanging baskets, a group of gardeners, downtown businesses and city staff worked together a decade ago to lock in a long-term stream of money for flowers. An event, Festival of Flowers, launched in 2010 and supported by then-Mayor Dan Sullivan, was aimed at raising money for an endowment fund. Volunteers enthusiastically sold quilt raffle tickets and potted plants, auctioned off the city’s trademark yellow-and-gold hanging baskets and helped children plant marigolds in Town Square Park. After threats of drastic cuts to city flowers resurfaced earlier this month, those volunteers were left wondering: Where did the money for the endowment go? Not in an endowment fund, according to records and city officials. Much of the little that was raised was quietly spent years ago, records indicate -- which came as news to many of the volunteers who worked on the event. Backers of the Festival of Flowers hoped to raise $20,000 in 2010 alone, on the way to a $1 million endowment. A fund of that size would spin off annual earnings of $50,000 for flowers, Cathy Janigo, the city official largely credited with coming up with the idea, told the Anchorage Daily News at the time. City officials now say that idea was well-intentioned but never realistic. The 2010 event raised about $10,000, which went into the city’s parks and recreation account, according to city officials and email records. According to an email from a parks official, nearly $6,000 from that account was spent in 2016 on landscaping in Town Square Park, after Mayor Ethan Berkowitz called for the large broken fountain in the center of the park to be torn down. Between 2011 to 2014, money raised during the event ended up in an account managed by the Anchorage Downtown Partnership. The account was later closed and deposited with the Anchorage Parks Foundation, records show. Foundation director Beth Nordlund, who was not involved in the festival or the endowment efforts, said she could confirm the Anchorage Downtown Partnership deposited $6,400 with the Parks Foundation, and the money was then spent by the city parks department. It wasn’t immediately clear where, and city development director Chris Schutte couldn’t confirm the account. Schutte was also the executive director of the Anchorage Downtown Partnership during the Festival of Flowers years. He wrote in an email this week that he couldn’t recall where his organization directed the money. It wasn’t very much, he said. In general, he said his organization stopped doing the event because it wasn’t very financially successful. He said that to support the city’s $800,000 downtown flower budget, an endowment would have to be “in the multiple millions of dollars." Nordlund added the Parks Foundation is happy to help set up endowments. But this was never an endowment, she said. Even so, some of the gardeners and volunteers were stunned to learn that news a week ago. “They robbed us,” Nickel LaFleur, a former president of the Anchorage chapter of the Alaska Master Gardeners, said in an interview. Darrel Hess, the city ombudsman, said he put in many hours helping kids plant flowers at the event. He said he was disappointed to learn it had been spent rather than saved. The disintegration of the endowment idea means that the city’s colorful downtown flowerbeds will remain vulnerable to cuts in the coming years. But so far, the program has proved resilient -- which says something about Anchorage’s identity, some longtime gardeners say. Flowers found a heyday in the 1990s, when Mayor Rick Mystrom championed beautification programs in his bid to turn Anchorage into the “City of Lights and Flowers.” The next mayor, George Wuerch, thought Mystrom went overboard on flowers. He tried to cut the city’s horticulture budget by 25 percent -- and faced stiff and well-organized opposition. One group, the Anchorage Horticulture Coalition, even hired a lobbyist, sent out a candidate questionnaire in the municipal election and embarked on a fundraising campaign. Most of the money ended up being restored, according to news reports from the time. When Mayor Dan Sullivan took office in 2009, he cut $159,000 from what was then a $2.1 million budget. Those cuts sparked the push to start the endowment and the Festival of Flowers. Small cuts over the years have shrunk the budget to about $1.7 million today. Further cost-saving proposals to rely on volunteers and downtown businesses have fallen flat. Assemblyman John Weddleton, who initially proposed dramatic cuts before dropping his proposal, said the city should find less expensive ways to do flowers, an approach also taken during the Wuerch administration. Jeff Lowenfels, an Anchorage attorney and longtime gardening columnist in the Daily News, has watched the budget battles over flowers unfold over the years as mayors and city Assembly members suggest cuts. It’s a convenient place to shrink the budget, he said. But those efforts are never very successful, because the flowers are so popular, Lowenfels said. He said politicians learn quickly that Anchorage residents don’t take their plants lightly. The flowers are great for tourism, but it’s even better for the people who live here, he said. Even so, Lowenfels had a prediction: In 10 years, someone in city government would try to cut the flowers again.